Shatamanam Bhavati is one of the telugu films in Sankranthi race. 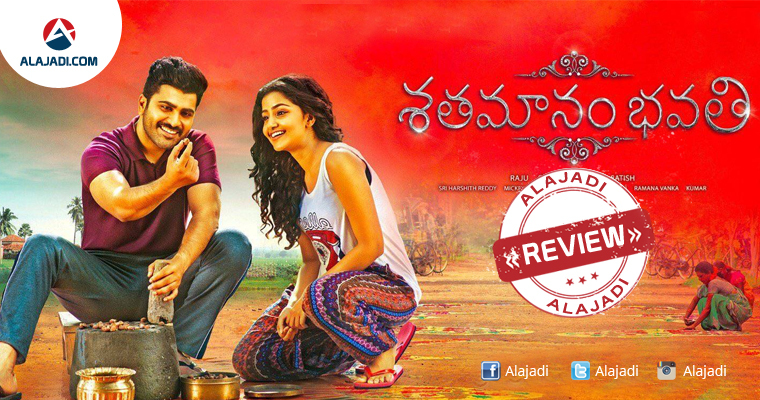 Already there is a positive buzz for the movie Shatamanam Bhavati as it might impress the family audiences. There are a lot of people who are really waiting to grab an opportunity to watch and enjoy the film amidst the two big Sankranthi releases. The film Shatamanam Bhavati stars Sharwanand and Anupama Parameswaran in the lead roles. Shatamanam Bhavati is directed by Satish Vegesna who is making his directional debut with the film. The film looks like having a very much interesting as well as impressive story. The story is set up against the backdrop of a village, a grand father and his grandson. Things start to change when the hero’s Maradalu visits India for a holiday. Things move on a happy note as one of his grand daughters, Nithya falls in love with Raju. The twist in the tale arises when Raju garu’s wife finds out about her husband’s plan and gets upset about it big time. This is also the time when small disturbances creep in within the family and create a tense situation. Shatamanam Bhavati is a clean classic family entertainer which showcases the various emotions of parents when their loved ones stay away from them. It presents you with beautiful country side visuals of Godavari district and then leads you into a nostalgic journey back to childhood. All songs are very good on screen, with a surprise for fans of yesteryear director Vamsi and Ilayaraj. This film has some very decent moments which you can enjoy with your entire family this festive season. Sharwanand: He has played a village guy who respects elders and gives importance to human emotions. Anupama Performance: She appears as his love interest. Both of them have delivered good performance and the chemistry between the two is the highlight of the film. Jayasudha and Prakash Raj have also done justice to their roles and are assets to the movie. The cinematography is an immense resource and Dil Raju never appeared to bargain on the film’s quality. Shatamanam Bhavati promotes Happy Living. It underlines once again to the audience, NRIs more specifically, the importance of visiting parents as often as possible. All songs are very good on screen, with a surprise for fans of yesteryear director Vamsi and Ilayaraja.